The cover for Cinder and the Smoke has been released! It’s a Victorian-era crime story set in New York and Seattle in the 1880s, featuring a crossdressing safecracker nicknamed the Smoke. When she starts making a name for herself in the underworld, she attracts the attention of a tenacious Pinkerton nicknamed Cinder. The novel comes out in ebook format in March! In nineteenth century New York, safes aren’t living up to their name. A thief so wily, so impossible to capture the the police call her “the Smoke” has been targeting the wealthy. In reality the Smoke is a woman named Kezia Cyr, a woman born in prison, stolen from her mother, and raised by runaways and pickpockets. When her emotions causes a job to blow up in her face, Kezia’s adoptive family scatters and she is left to avenge those she’s lost. 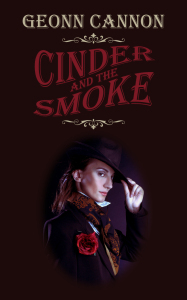 The Smoke may finally meet her match in Pinkerton Agent Shelby Button who earned the moniker “Cinder” for running into a burning building to capture a criminal. Button finds Kezia’s trail and refuses to let her prey go without a fight. Sounds like another great book. Can March hurry up please?